On april 1, Jerry Brown, governor of the American state of California joined the chief of the California Cooperative Snow Survey Program as he wielded a stick to measure snow levels. They stood at Phillips Station, 2,073 metres high in the Sierra Nevada mountains that run down the eastern edge of America’s most populous state. It receives the bulk of its rain and snow between September and April, and Phillips usually sees one-and-a-half metres of snow. But that day, Brown stood on a field without a trace of snow. “We are standing on dry grass, and we should be standing on five feet (1.5 metres) of snow,” he said. 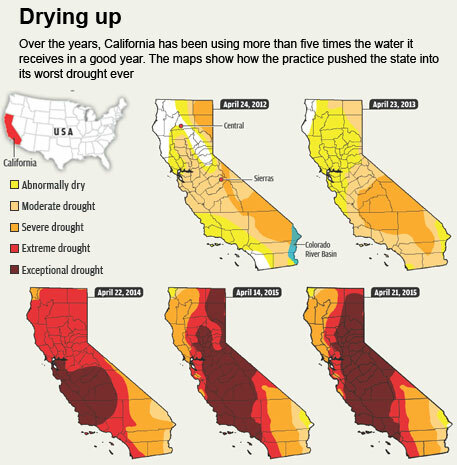 In what is now the fourth straight year of California’s highly publicised drought, Brown ordered mandatory water restrictions for the first time in California’s history at a press conference during the survey. About 400 different agencies that supply water to the bulk of California’s residents will have to reduce supplies between four and 36 per cent, depending on their current conservation efforts. “The idea of your nice little green grass getting lots of water every day— that is going to be a thing of the past,” said Brown. The drought is not just about lack of rain, but also rising temperatures across the state. The last three years have been the hottest periods in the entire 119-year recorded history of California’s weather patterns. In other words, in place of snow that settles as snowpack mountains receive rain that runs off. The Sierra snowpack is a crucial supply of water for the rest of the summer months, releasing water like a slow-release pill to the reservoirs that feed the state. Today, it’s at six per cent of normal snow levels. Researchers at Woods Hole Oceanographic Institute concluded that this combination of a dry and hot weather pattern makes the current drought the worst in 1,200 years. 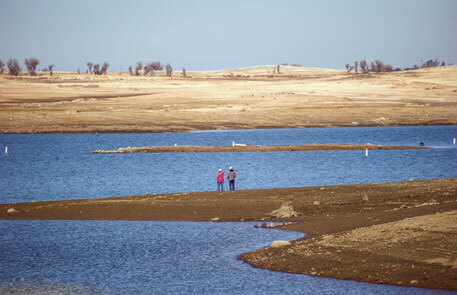 The drought has prompted the state to revisit where the water goes. About 80 per cent of all available water feeds California’s US $46 billion agriculture industry. The 724 km long Central Valley, with its high quality soil and months of sunshine, is single-handedly responsible for producing more than a tenth of agriculture revenue in the country. It has everything, except readily available water. The southern part of the state gets water through pipes from the Colorado River Basin and through two large public works projects, the Central Valley Project and State Water Project. These deliver water from the Sierras through a vast array of pipes, canals and dams. A drive along Highway 99 that runs vertically through the farm belt of California gives a glimpse of the audacity and ingenuity of engineering to feed the global need. What might have been arid plains is dotted with miles of rows of grains, fruits and vegetables, from rustling alfalfa fields, to petals falling off in the almond orchards. 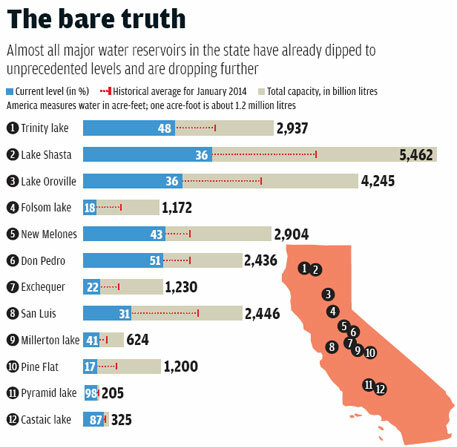 Over the years, California has promised more water than it can ever deliver. A 2014 study by the University of California Davis showed that the State Water Board had allocated a maximum of 370 acre-feet (444,000 billion litres) in water rights, more than five times the 84,000 billion litres that the state gets in a good year. Due to the drought, farmers have fallowed about a quarter of the paddies. But there are alternative, even ideal, grains for arid regions. Millet, for instance, is an ancient and extremely drought-resistant crop that sips less than a third of the water needed for rice. Millets have also been grown in southern California in the past. But over the past 50 years, the worldwide millet consumption has gone down 45 per cent, replaced mostly by rice and wheat. To bring back diversity in our grain diet, a group of researchers at the University of California Berkeley are now spearheading a pilot program to grow this protein-rich, iron-rich, gluten-free crop by working with individual farmers across the state. And while the crop can grow on a variety of soils, the key to scaling would be to find the optimal soil and climate. The drought forces farmers to ask whether water should be diverted to seed, or seed to water, whether it is better to adopt crop to climate. 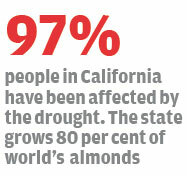 California also produces 80 per cent of the world’s almonds that take up 10 per cent of all water. While almonds by themselves are not the most water-thirsty crops, they are highlighted since precious water is being diverted towards a permanent tree that is not part of a staple diet. Such trees need a constant supply of water over many seasons. A farmer with an almond orchard investment will either have to kill off his trees or be willing to pay more for water from elsewhere. 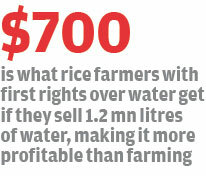 The drought has given incentive to selling water instead of a crop. For instance, some rice farmers with senior rights in the Sacramento delta have found that instead of growing rice, it is more profitable to re-sell water for as much as US $700 per acre-foot, more than double the normal price. On the whole, farmers fallowed 171,200 hectares last year and the industry suffered about US $2.2 billion in losses. More than 17,000 workers lost their jobs. Some migrated to other parts of California in search of work, some moved back to Mexico. The Community Food Bank at Fresno that feeds the poor, sees up to 10,000 more people each month, something it attributes entirely to the drought. Kym Dildine, the food bank’s development director, calls the drought a “slow moving disaster”—those who till the fruit and nut bowl of the USA are now getting their own food shipped from elsewhere. The drought and these difficult conditions also expose the underlying politics of water management and engineering. To many in the Central Valley, the reason they feel they are in this drought is not because of a lack of rain but because the state is letting too much water flow back into the ocean. Protest signs face the highways that run alongside the fields and orchards around Fresno. “No water = no jobs,” says one. “Stop the dust bowl,” says another. Banners exhort that this is a “Congress-created drought”. Water that enters the delta is managed for a variety of purposes. Some of it is regulated to sustain populations of many endangered species in the Delta waters, including salmon, smelt and sturgeon. For many farmers in the Central Valley, water for fish is the reason they think they are not getting water for their farms. And it is as if conservation agencies are happy with the allocated water. Over 95 per cent of the Chinook salmon died last year during their spawning migration, partly because they could not survive in the warm low waters flowing out of the reservoir. And in the Fish and Wildlife department’s latest trawler survey to estimate fish populations in the wild, they found only six delta smelt in the wild. Due to the scarcity of surface water, the state relies heavily on groundwater to fill the gap. Even in an average year, groundwater has to meet about 25 to 30 per cent of California’s needs. 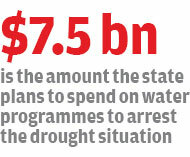 But in extremely dry conditions, the state can pump groundwater for 46 per cent of its needs or more. The results are staggering: over 60,000 billion litres of groundwater has been pumped out of the Central Valley’s aquifers over the past 50 years. Today, the gap between what is pumped out of the ground and what can be refilled through natural and artificial sources is about 2,400 billion litres of water per year, compounded year after year. As the water table keeps lowering, farmers dig deeper wells in search of still lower groundwater. In a 2014 study of the Colorado River Basin, researchers at the University of California Center for Hydrologic Modeling found that the basin had lost over 60,000 billion litres of water over the past 10 years. 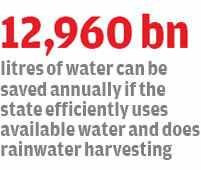 More than 80 per cent of that was groundwater. “It has taken a very long time for that water to get there and we are depleting it in a decade,” said Stephanie Castles, the paper’s lead author. It is a similar story in the Central Valley where excessive pumping has meant that the groundwater level has dropped by more than 15 metres in some regions of the Central Valley, according to a November 2014 report by the Department of Water Resources. Finally, last year, Governor Brown signed a new law to regulate groundwater pumping, making it the last state in the country to do so. While the long overdue law will help curb the unregulated use of groundwater, it has a long gestation period. Local groundwater agencies do not need to form till 2017, and they do not need to have plans in place before 2022. A lowering water table underscores the fact that in the end, there is no substitute for rain or snow. In November last year, California’s voters approved a water bond. The Water Quality, Supply and Infrastructure Improvement Act allows the state to sell US $7.5 billion in bonds to fund water-related programs. While none of the money is available for immediate drought relief, the intent for all projects is to handle future droughts better. A third of the fund, about US $2.7 billion, is earmarked for new water storage projects including building new dams to contain water. On the other hand, only about US $100 million—one per cent—will go toward water conservation efforts. That is in spite of decades of research that has shown that conservation and efficiency can go a long way in saving water. Efficiency can be bumped up in homes by fixing leaks and switching to water-saving shower heads, toilet flushes, taps, and clothes and dish washers. Instead of dumping wastewater into the ocean, urban areas could treat the water for reuse. The city of Santa Rosa, for instance, recycles almost all of the wastewater it generates every year. About half of the state’s urban water use is outdoors, for things like maintaining green lawns, filling up pools and washing sidewalks. For instance, San Francisco, with a milder climate and minimal landscaping around densely populated apartments, used about 174 litres per resident each day in September last year. At the same time, the northern suburbs of San Diego with large landscaped homes and irrigated residential orchards, chugged almost 13 times the amount of water in the same period. Examining water use shows that while on average, each of California’s residents uses about 681 litres per day, this average rarely accounts well for economic disparity. The residents of Beverly Hills in west Los Angeles might use almost six times the amount of water compared to their fellow residents in less affluent east Los Angeles. Most of that is outdoor water use. Now, counties across the state advertise “Cash for Grass” incentives by offering a rebate for replacing grassy lawns with native plant species that are naturally drought-resistant. Nurseries in the San Francisco Bay Area sell plants with “Water Smart” tags to help consumers know what might need less water. In residences and offices, rainwater harvesting and retrofitting traffic and parking lot islands, road dividers and sidewalks with marshy drainage swales can reduce surface run-off into the ocean. These efficiency methods were laid out in a 2014 report released by the National Resources Defense Council and Pacific Institute, a non-profit research institute working on sustainability issues. By conserving and efficiently using available water and capturing more rain, they estimated that the state could get at least 12,960 billion litres of “extra” water per year, almost a quarter of all of the state’s agriculture and municipal current water use. Despite the perceived conflict between environmental and agricultural needs, Heather Cooley, director of the Water program at the Pacific Institute, stressed that everyone’s needs could be met by focusing on efficiency and conservation. “These two things do not need to be at odds,” she said. For instance, the report said, millions of acres of farmland could be switched to drip tubes and sprinklers with scheduled irrigation. Drip techniques, which use pipes to carry water either above or below the soil and directly deliver to the plant, can reach 90 per cent efficiency rates. WATER RIGHTS in California follow multiple levels of hierarchy and are a reflection of growing demand over more than two centuries of economic development. Early settlers migrated westwards to California in the 18th century and early 19th century. And if they owned land that bordered a river or lake, they had rights to that water. Such owners have the senior-most rights in the state. In the second half of the 19th century, the state drew scores of explorers looking for gold, and with them came numerous ancillary jobs. People started channeling water toward their farms, mines, and cities and would stake a claim on the water often by posting a notice at the site and lodging the details with the county. These are called appropriative rights, and this was roughly how it was done till 1914. Who gets how much of the water depended on who made the call on the water first. After 1914, however, the state required people to apply for a water permit. Typically, those with post-1914 water rights are called junior rights holders, and they are lower down the water chain. California getting wetter to the north, drier to the south: Natural variability or climate change?